The casino races we run at EmuCasino are simple competitions that allow our players to get even more from playing our slots games. On top of players being able to play the games themselves, we also allow customers to win something over and above what normally they’d expect to win on the slots themselves. Check out all the latest casino races and past ones on our casino race master page. 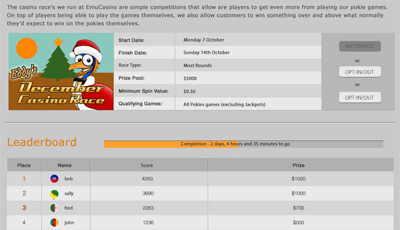 Casino races were incredibly popular on the old EmuCasino and we’ve now expanded these to be even more exciting. As well as having races based on spins, it’s now possible for us to offer races on many other criteria. There are a few different ways in which races can work now, however one thing they all have in common is that they all feature a simple leader board that ranks players based on where they are relative to everyone else within the race. One of the most common races is based on the amount of spins they put down on any pokies within a set timeframe (usually a week). Our Casino Races normally have a very minimum of 10 positions and 10 prizes to win, with prizes ranging from simply cash to desirable gifts or exclusive days out. There are now a couple of different options when it comes to getting involved in a race, with most races being automatic, meaning that unlike a lot of our competitors you’ll be entered automatically, so ever if you have no interest in actively partaking, you might receive a prize or cash equivalent into your Emu Account with confirmation by email. On top of this we also offer exclusive races which only certain players can enter, these can be for our VIP players or can be for set for everyone where players get the choice to Opt in, or if the prize pool is really something special, get to buy into the event. How can I keep track of where I am in the race? Each race can be seen once logged into your account, by simply navigating to the casino races page and you can track where you are within the race. 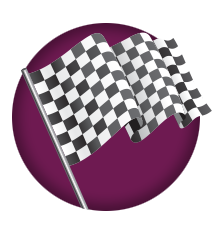 Once the race has finished, you will receive an email confirming the end result and your final position within the race and what you have won.